Virasyl® is a dietary supplement that was formulated in a medical clinic with the intent to improve the quality of life and help to reduce the consumption of medications. It is an organic (carbon bound),full spectrum multi-mineral supplemen with Shilajit and Fulvic Acid. Shilajit is a unique, organic material found in rocks of the Himalayan mountains. It contains small strands of plant RNA, DNA, amino acids, enzymes and bioactive photo-synthetic materials. Shilajit has been used in Ayurvedic medicine for thousands of years. Fulvic acid is a naturally occurring organic acid found in Shilajit. Literature review reveals that it “protects mitochondria and reduces lipid peroxidation.” It is reported that Fulvic Acid assists to stabilize the cell membrane so that nutrients may enter the cell more readily and waste is removed more easily. 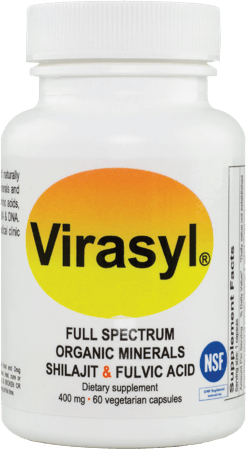 Virasyl® DOES NOT CONTAIN the following: soy, wheat, gluten, corn, milk, egg, sugar, magnesium stearate, colors, gelatin or preservatives. Each bottle contains a 1 month supply (60 vegetarian capsules) of organic minerals, shilajit, humic and fulvic acid. FREE SHIPPING! We recommend 2 caps in the morning with fresh, non-chlorinated water and/or food. Human body composed of 18% carbon. It is the backbone structure for DNA, RNA, amino acids, protein, carbohydrates and fatty acids. Human body contains 10% hydrogen. It is the most abundant element in the universe. Oxygen is the most abundant element in the human body at 65%. Every metabolic process requires oxygen. Human body contains 3% nitrogen. It is primarily found in RNA, DNA, amino acids & proteins. Human body contains 1.5% calcium. Calcium combines with phosphate to form a mineral found in bone and teeth. Calcium is used to signal many cell processes including heart, muscles and neurotransmitters. Human body contains 1% phosphorus. It is a component of RNA, DNA, ATP and found in the phospholipid membrane of every cell. Human body contains 0.25% sulfur. It is a component of cysteine and methionine and prominent in keratin protein found in skin and hair. Human body contains 0.20% potassium. It is essential for nerve transmissions. Sodium builds charge on cell membranes in order to transmit nerve impulses. Human body contains 0.20% magnesium. It is the fourth most abundant mineral in the body; responsible for more than 300 biochemical reactions, ATP production, and protein synthesis. Iron is mainly essential for oxygen transportation and growth of cells. Zinc is found in ALL cells. It is necessary for DNA and protein synthesis; aids in wound healing and important for senses of taste and smell. Iodine is necessary for synthesis of thyroid hormones. Copper is a component of certain proteins that process oxygen. Human body contains 0.002% silicon. Boron is extremely important for bone health as it activates vitamin D.
Selenium is an essential trace element incorporated into proteins thus making antioxidant enzymes and supports thyroid function. Strontium is essential for bone health. Bromine functions along with an anti-parasitic enzyme of the immune system. Gallium salts are in development for human consumption. Human body contains 0.00014% Gold. Lithium is an essential trace element. Lutetium is an important component of healthy bones. Molybdenum is found in liver and kidneys. Deficiencies have been associated with adverse health conditions. Human body contains 0.00046% rubidium. Ruthenium is used as a therapeutic agent due to photo-physical properties. Chromium is necessary for sugar and fat metabolism. Cobalt is an coenzyme for B12.